Moon Day Tomorrow or on any dates you are interested. What is the Moon Day Tomorrow - phase, illumination, visibility, moonrise, moonset, zodiac sign and the house of horoscope, growing or waning Moon you can see on this page, and even lunar days for the whole month in April 2019 Moon Calendar. Everything about Moon Day Tomorrow or on any other date. The day will show how your beginnings had harmonious effects, will help in the harmonization of the internal structure and secure the turned position, give an objective assessment of commitments. This day reflects your ability to do something on their own (as if the pure zero outside). 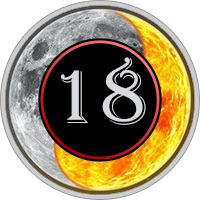 The eighteenth day of the moon - the mirror day. External today is like a reflection of our inner world. There may be a desire to obey the will of another. Adapt. This can and take advantage of their advantage.